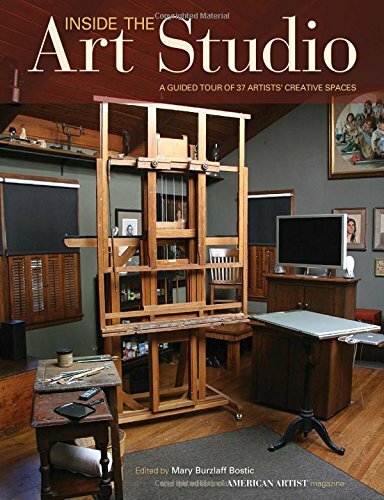 I must admit there's more than a tinge of envy as I looked at the pictures of the art studios featured in the book. They look so beautiful and full of creativity waiting to happen. Inside the Art Studios is an insightful book that brings you behind the scenes into the private studios of 37 artists. These artists are all located in USA and hence you'll pick up frequent mention of their preference for north light. The content is grouped into several chapters each focusing on a specific function or purpose of the studios. There are home studios, portrait studios, education studios and the last chapter is about converting spaces into studios. It's nice to see a good variety of artists and creators and their work spaces. You'll get to explore the studios of sculptors, painters and educators. The text talks not only about the studios but also the artists' work process. There are also information like the repairs they have to do, modifications to the house such as installing windows, lighting, heaters or how they arrange the furniture. You'll also read about how some places such as an industrial complex, barn, church or garages are converted into studios. There are tips for specific type of artists. For example, the things you should look out for when setting up a studio for portrait drawings, like you'll need the space for the model to pose and rest. Or if you're going to conduct workshops, how much space and what type of arrangement might work. Of course your needs would be different, but there are plenty of insight to be learned from these artists as they talk about what it's like to work in their studios. It's an insightful and interesting book. Recommended to artists and those who like exploring creative work spaces. If you like this book, I recommend checking out Where They Create which is another book about work spaces.